The modern military shooter that's sold an astonishing 14 million copies worldwide since November 2009 can check off another record-snapper: Fastest selling downloadable content pack. Released just nine days ago, the $15 Modern Warfare 2 map pack, dubbed "Stimulus Package" by Activision and time-exclusive to the Xbox 360, has been downloaded over 2.5 million times, 1 million of those in its first 24 hours of availability. 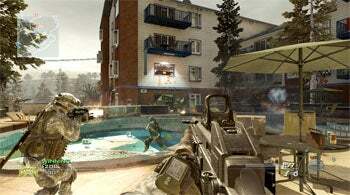 The pack, which adds five multiplayer maps to the game, will be available to PS3 version owners on April 30 (and, presumably, set a PlayStation Network record at that point as well). Talk about lucrative: At $15 a pop, the game's garnered $37.5 million in sales, of which it's estimated $26 million went to Activision. No wonder the publisher's planning to spin the entire Call of Duty franchise into a dedicated business unit with "a focus on high-margin digital online content." And that's just round one. A second downloadable content expansion for Modern Warfare 2 will be available later this year. The next series installment's due already this fall from Treyarch (Call of Duty 3, Call of Duty: World at War) and a new Activision-shepherded studio, Sledgehammer Games, has dibs on a 2011 action-adventure franchise spinoff. Microsoft claims players have spent some 1.75 billion hours online with Modern Warfare 2 since its release last fall. Number of hours I've contributed to that total: Zero. I'm sure that's some kind of record (among game writers, anyway) too.